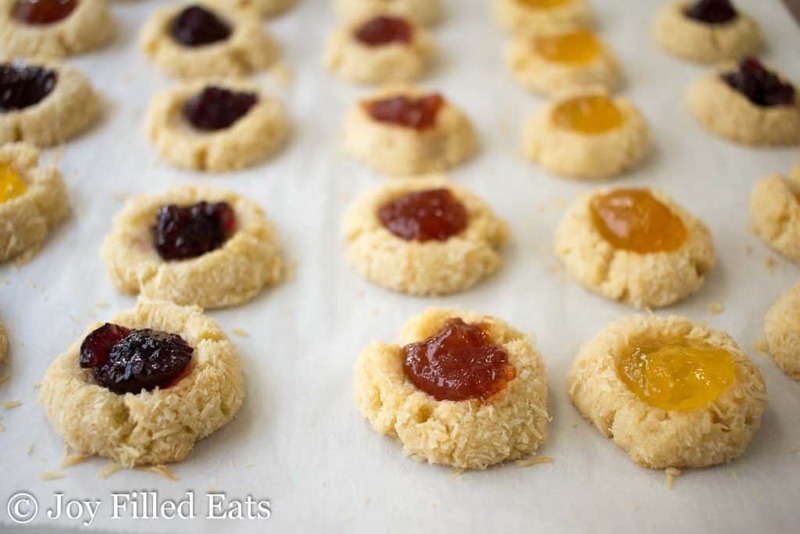 Jam Thumbprint Low Carb Cookies are very easy to make, pretty, and tasty. They are such a holiday classic I don’t think I’ve ever been to a cookie exchange where someone didn’t make these. Trays and trays of cookies are a Christmas tradition in my home. We bring a tray to my cousin’s house, put out a tray when we decorate the tree, bring another tray to the Christmas pageant at my children’s school, and put out one more tray on Christmas day. 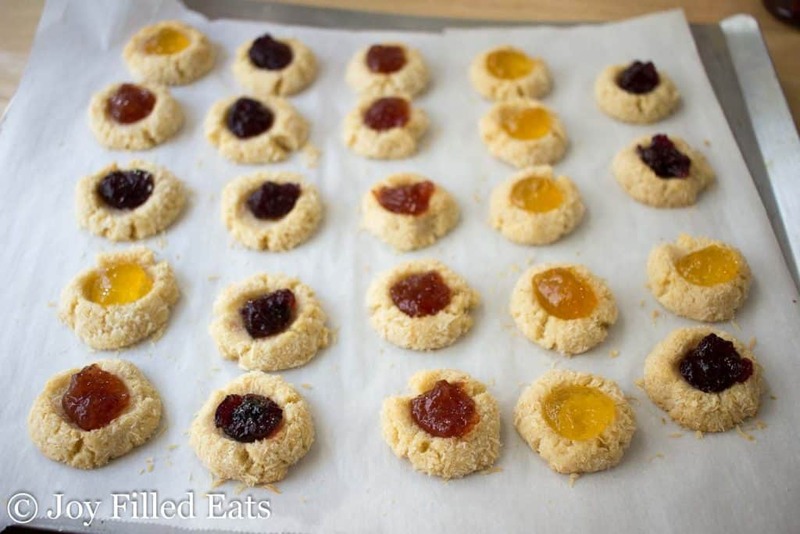 If I want low carb cookies so I don’t cheat on my eating plan it is my job to bring my own, such as these Jam Thumbprint Cookies. With that many trays of cookies needed I need easy recipes to fall back to. I don’t have time to make hundreds of cut out sugar cookies decorated with fancy icing. 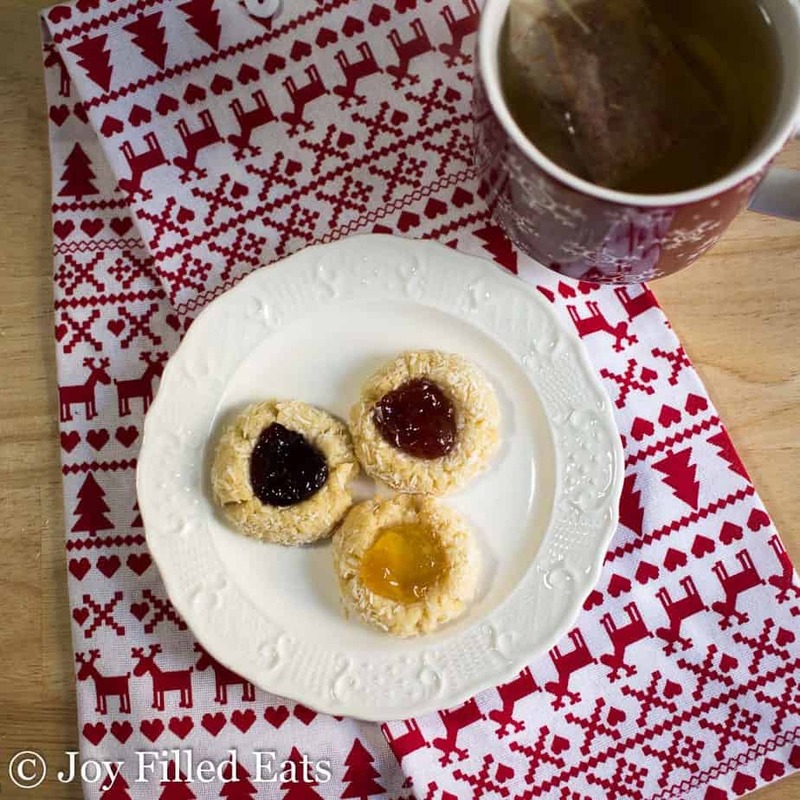 These jam thumbprint low carb cookies are so much simpler. The dough is pulsed in the food processor, blobs are dropped into coconut, they are put on a parchment lined tray and pressed by a thumb. Add a dollop of jam and that’s it. 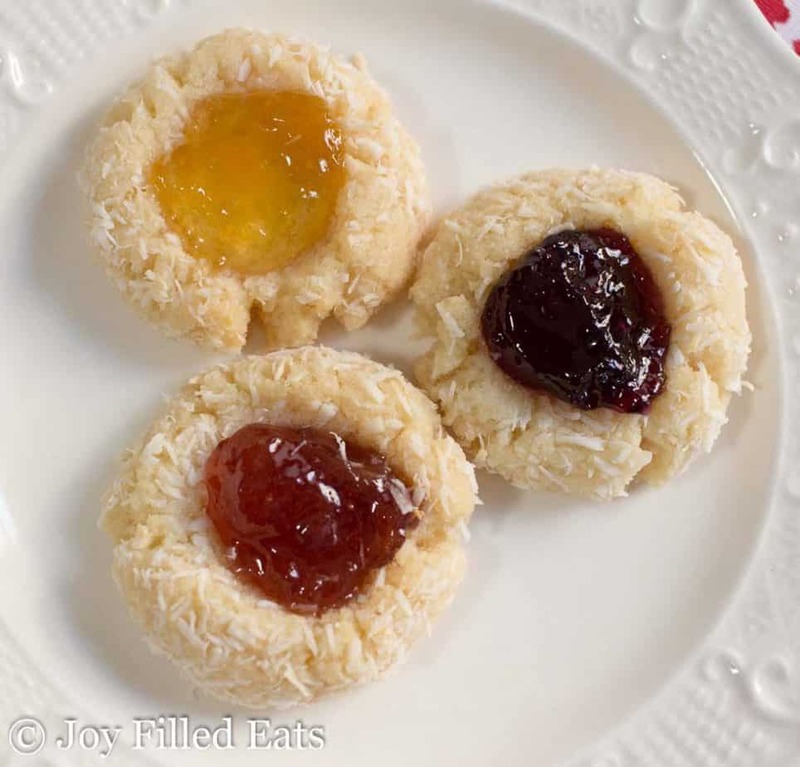 I put wax paper between layers of these Jam Thumbprint Low Carb Cookies when stacking so they stay nice and neat. It works perfectly. From the beginning of December through the end of the Christmas season you can find several large plastic containers of cookies in my freezer. Now that my daughters like to bake they’ve been making as many cookies as I have. There is something for everyone whether you prefer chocolate, cinnamon, nuts, or a combination! This is a great recipe to let kids help with. If they are too little to work the food processor or scoop the dough they can still roll the dough balls in coconut and then press the thumbprint with a couple tiny thumbs. I always use parchment paper when baking cookies. I buy one huge two pack at Costco and even with all the baking, I do for the blog one pack lasts me years. It is a worthy investment to make sure your cookies don’t stick and it saves on clean-up. It also helps when making multiple batches because you can slide the parchment off of the baking tray (if it’s edgeless like my airbake cookie sheets) so that it cools faster. Scoop the next batch onto a fresh piece of parchment and then slid that onto the cooled cookie sheet. You could also roll these in finely chopped nuts or skip the topping all together. They are delicious with or without it. Aren’t the different colors of these low carb cookies pretty? I used Polaner All Fruit Peach, Strawberry, and Blueberry Jams. You only put 1/2 tsp on each cookie. This type of jam adds about 1.33 carbs per cookie. Using a reduced carb jam will reduce that number even more. 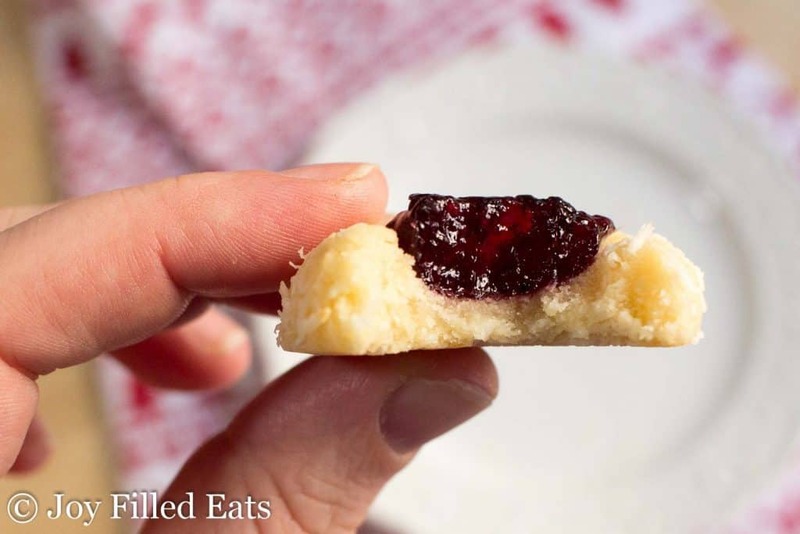 Jam Thumbprint Low Carb Cookies are very easy to make, pretty, and tasty. They are such a holiday classic I don't think I've ever been to a cookie exchange where someone didn't make these. 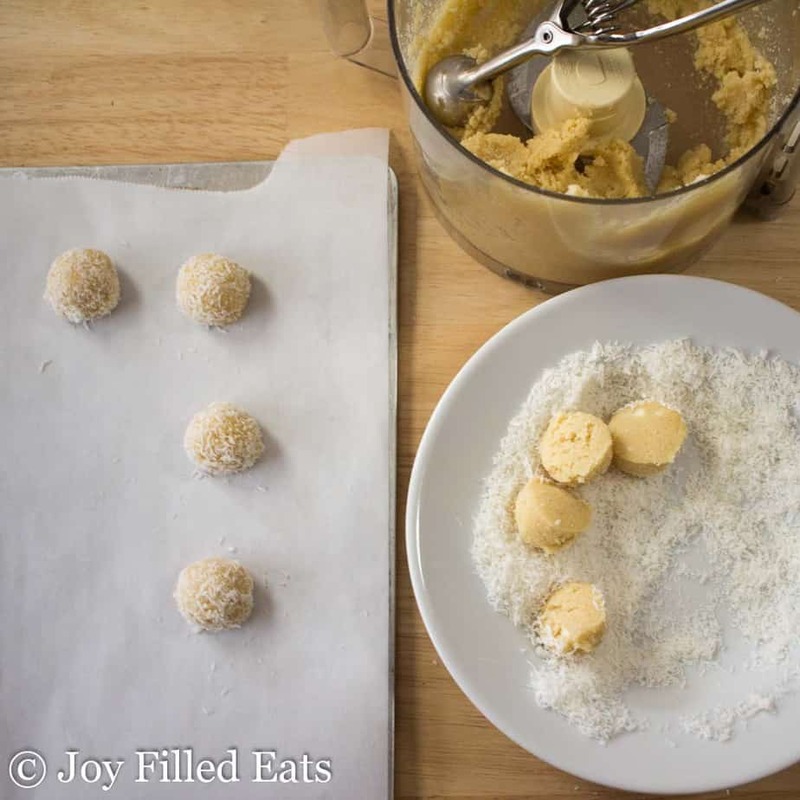 Combine the butter, almond flour, coconut flour, sweetener, gelatin, and vanilla in the food processor and pulse until it comes together in a ball of dough. 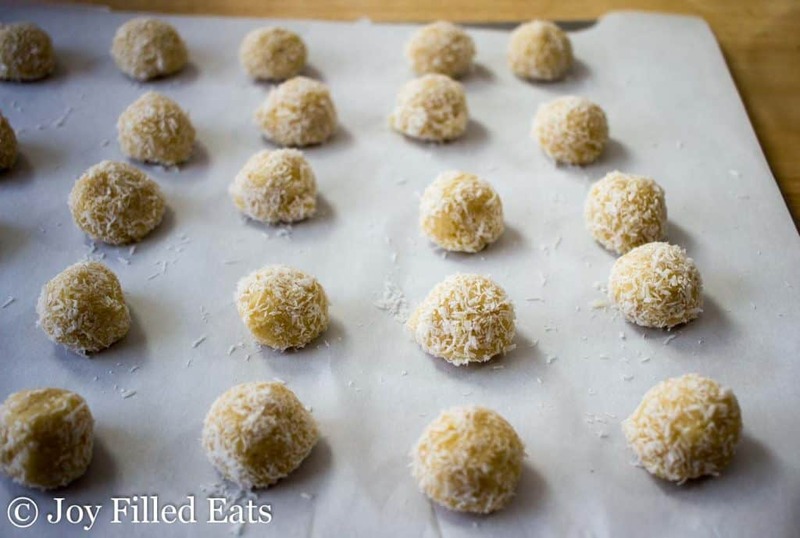 Divide into 28 balls and roll each in the coconut. Put on a parchment-lined lined baking sheet and press down making a little well with your thumbs. Bake for 14-17 minutes or until lightly browned around the edges. Use a small upside down measuring spoon to press down the center of each cookie. 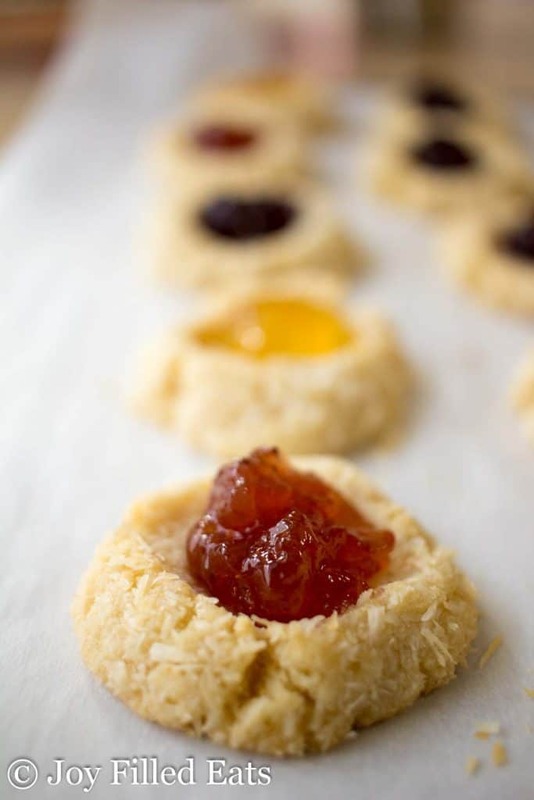 Put 1/2 tsp of jam into the well of each cookie. Cool completely. Store in the fridge. This dough can seem dry when processing in the food processor. Don't worry! Just keep the machine running until it comes back together into a ball. 2 Tbsp of cream cheese works in a pinch. When you're craving sweets and don't have gelatin. It just makes a very soft cookie which still very delicious. Good to know. I would've suggested using 2 egg yolks. I used cornstarch instead of gelatin since I couldn't find kosher gelatin in town. I'll have to order online because I'm definitely baking these again! 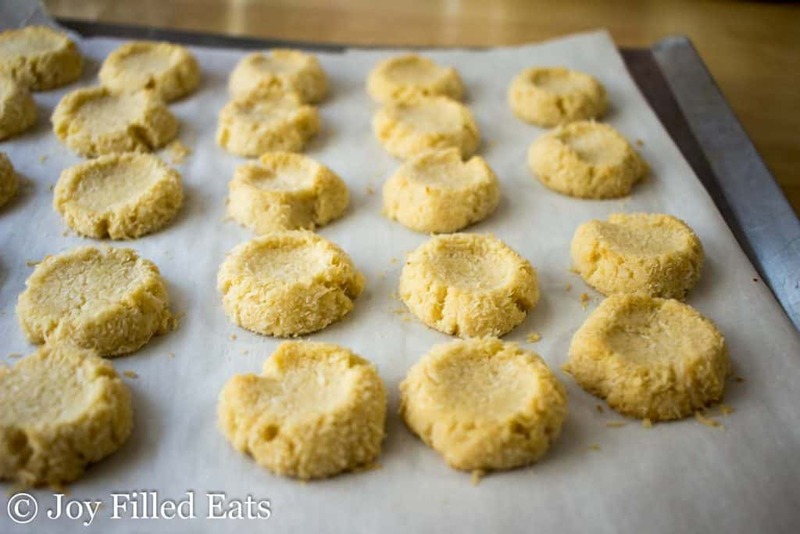 I'm absolutely in love with this recipe, they are delectable!! I'm making my second batch already from yesterday..lol! It says 28 balls formed from one recipe? The best I can get is 24, and they are still very small. I was wondering if the quantity was correct on one single batch recipe? Hi, there! I realize this is an old post, so, hopefully I'm seen! I love coconut, but, I'm a purist in some things. Jam cookies is one of those things. Can I sub half almond/half baking blend for the coconut flour and skip the rubbing in coconut flakes? I'll make coconut macarons to get my coconut intake! Perhaps I am missing where you say this, so I apologize, but how many is a serving? 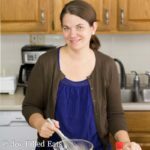 Thank you so much for creating delicious recipes! These cookies taste great! I did switch out the sweetener with Puyre as that is what I had. And maybe that was my mistake, but this batch came out so crumbly. Other than the sweetener, I followed the recipe to a "T". Another commenter mentioned adding more butter. Is that something I should try next time? They whipped up so easily I would love to keep making these for my diabetic husband. Thanks for your time! And Merry Christmas!! Switching the sweetener may have caused them to be crumbly. You can definitely just add a little more butter. I just wanted to tell you that these cookies are so awesome. I love them, and even my husband, who swears he hates coconut likes them a lot. They will be part of our Christmas Eve traditions from now on. And now, I will make your sugar frosted cookies... the kids will decorate theirs with real sugar icing, but I feel better that at least the cookie part is healthy. God bless you and Merry Christmas! Hooray! I've made the full o carb version for years. I've been craving them! Thank you! Now I can have my cookie and eat it too! Made these today after drooling over the recipe for a week or so. I used THM Super Sweet Blend (a little less than half the amount called for) b/c that's what I had. I doubled the recipe. I needed 1/2 stick more of butter to form the dough (guessing my area is drier). They were absolutely amazing. HANDS DOWN the BEST cookie I've eaten (minus oreo-type cookies in my pre-sugar-free days....LOL). Thank you. These look so good! But, do I have to use the gelatin? Yes, it acts as the binder since this doesn't have eggs. I love jam thumbprint cookies but just can't get myself to like coconut flour in baked goods. Gives them a dry, dusty taste to me. 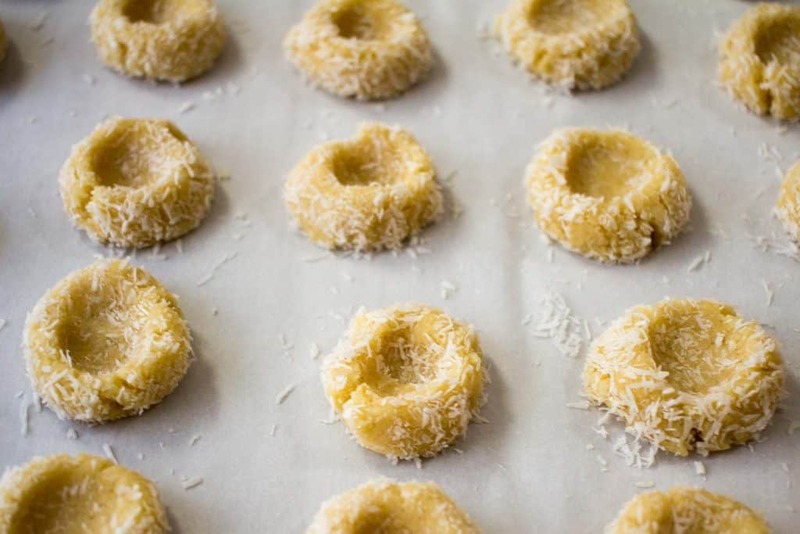 Is there anyway to make these with all almond flour? Thanks. I haven't tried yet but I think it would work. Just add twice as much as the part of coconut flour. Hi! This recipe sounds delicious! I can't wait to try it. I also love your sweetener blend; if I don't powder it, should I still use 1/3 cup or should I use less? Thanks! I used 1/3 cup without powdering it for this recipe.